The 12-month forecast through May 2019 indicates surpluses along the Lower and Middle Ob River in Russia, reaching exceptional levels in the Upper Ob and Tom River Basins. Severe surpluses are forecast along the Irtysh, Ishim, and Vakh Rivers. Both deficits and surpluses are forecast for the Volga River Basin in western Russia. Severe to exceptional deficits are forecast for Turkmenistan, Uzbekistan, western Kazakhstan, central Kyrgyzstan, eastern Tajikistan, and between the Sea of Azov and the Caspian Sea. Surpluses are forecast for northern Kazakhstan and eastern Kyrgyzstan. The forecast through November indicates that deficits will downgrade considerably in Turkmenistan, Uzbekistan, western Kazakhstan, and the North Caucasus region. 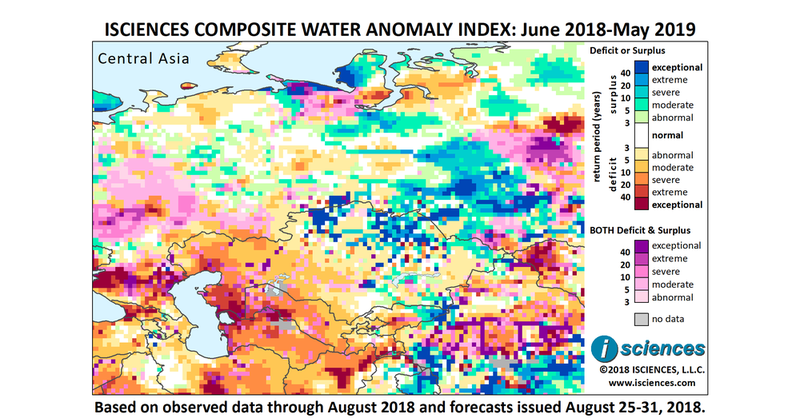 Moderate deficits are forecast for northwestern Kazakhstan and across the border well into southern Russia but deficits may be severe along the Ural River. Surpluses are forecast in Russia along the Middle Ob River, and in the Vakh River, Upper Ob River, and Tom River regions, and will be exceptional in the Upper Ob and Tom regions. Surpluses are also forecast for northern and eastern Kazakhstan and eastern Kyrgyzstan. Conditions of both deficit and surplus are forecast in western Russia as transitions occur. From December through February, moderate to severe deficits will emerge across the breadth of Kazakhstan, and severe to extreme deficits will increase in southern Kyrgyzstan and eastern Tajikistan. Surpluses will persist in eastern Kyrgyzstan and along the Ili River in southeastern Kazakhstan. Moderate to exceptional surpluses will re-emerge in the Middle Volga and Don River regions in Russia. The forecast for the final months – March through May – indicates moderate to severe deficits in Uzbekistan and Turkmenistan, the re-emergence of surpluses in northern Kazakhstan, a transition from deficit to surplus in the Ural River watershed in Russia, and persistent, widespread surpluses in the southern Ob River watershed. Ongoing drought has left over 200 wheat processing factories in Kazakhstan without work and on the verge of bankruptcy, prompting the federal government to consider importing more wheat. Drought has reportedly caused a 700,000-ton domestic wheat shortage in Kazakhstan. The country’s ministry of national disaster management reported supplying 20 provinces with over 56,000 tons of wheat. The European heatwave appeared to take a toll across many of Russia’s grain producing regions. Drought caused grain losses of up to 20 percent with respect to last year in Stavropol Krai, the country’s third largest grain production region. Drought in 11 districts of the Chechen Republic damaged almost 12,000 hectares (29,652 acres) of cropland, prompting a declaration of emergency and a promise of compensation from the federal government for losses estimated at 1 billion 300 million rubles (~USD$20 million). Other regions in southwestern Russia, including the Orenburg and Saratov oblasts (federal districts), incurred drought-related agricultural losses as well. Russia’s Ministry of Agriculture estimates total losses in the country at 6 billion rubles (~USD$92 million).